What if your fate is to lose the one you love and be doomed to live in a city of lost hearts? Is it possible two dead hearts can see life again? As I started reading this, the only thing I could think was: dear god, this is darn sad, but you know what? No, it wasn’t. In the end I got a short story full of hope. It amazes me how an author can convey so much with such a short story. I felt so many things reading this. The sadness – such a deep heart-wrenching sadness. The frustration of seeing them hold onto something that wasn’t coming back. The hope as I saw the MC’s starting to live again, smiling again. Daniel is positive that the town he lives in is cursed, and that all the people who live there end up heartbroken and so sad that they kind of die inside. When Daniel moved into this place with his partner, Sam, they had all these plans of living and growing old together, but then Sam left. And the sadness that takes over Daniel is so strong that he practically stops believing. One day Daniel sees that a new couple is moving into the house next door. He warns them, but they move in anyway. Before too long, Toby, one of the guys who moved in is left alone, heartbroken. Pain make us lose focus, and sometimes we are so invested in what we are feeling that we forget there’s a whole new world out there waiting to be discovered. Daniel and Toby start spending more time together. They start enjoying each other’s company, and they start enjoying themselves. They still miss those who left them behind, but they move on. They don’t know this yet. It takes them a while to figure it out, but as a reader, as you go through the pages, you start seeing it. It’s lovely, and heartwarming, maybe even a bit magical. I had to read the ending a couple of times… I was SO confused, and I’m still not sure I got it right, but whatever it is that happened, there is love there. There is hope… There are two men who thought they’d lost it all, but then realized that what they’d be looking for so long had been right in front of them for a long time. 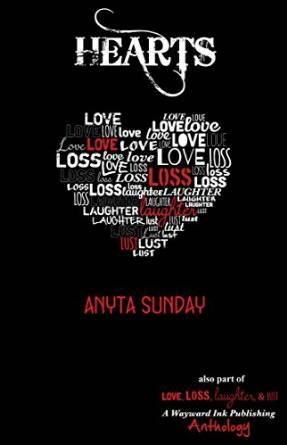 This entry was posted on June 2, 2015 by Gaby in Contemporary, Reviewer: Gaby and tagged 4 Stars, anyta sunday, short story, Wayward Ink Publishing.